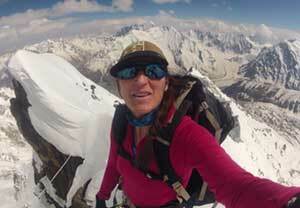 Cathy’s most challenging expedition was not Everest, but rather an attempt on a new route on one of the world’s top 10 mountains – the Mazeno Ridge on Nanga Parbat. It was one of the last great problems in the Himalaya: ten kilometres long, lying at 7000 metres with 8 subsidiary summits, the longest unclimbed ridge on any 8000 metre peak. Ten teams had tried it and all had failed. 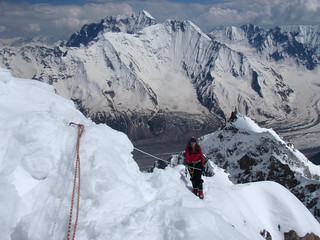 With a small team climbing alpine-style (fast, light and unsupported), the team of six came within inches of disaster before finally getting two members to the top. Sandy Allan and Rick Allen, who had neither food nor water left, then had to get down the other side of the mountain. The summit pair would win a Piolet d’Or (the mountaineering equivalent of an Oscar) for their performance. Meanwhile Cathy and the rest of the team were struggling to descend down unknown ground, caught by nightfall in a vast avalanche bowl, with one of the team now injured. 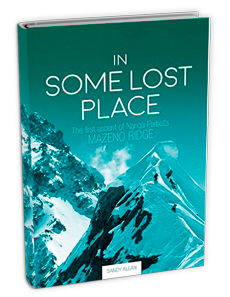 This is the epic story of an incredible feat of endurance and commitment at the very limits of survival and the first ascent of one of the last challenges in the Himalaya.